One owner from new. Stored ashore for 8 months a year. Private use only. 2016 Capelli Tempest 850 WA lying ashore in Bulgaria. This boat is a one off with special colour combination and upgraded engines. 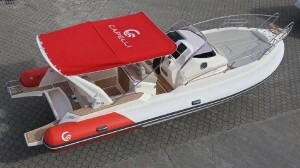 The Capelli Tempest 850 WA benefits from a good specification including rather fetching red and white tubes and bimini, touchscreen chart plotter, artful teak flooring, 220V shore power system and stereo system. She is the only Tempest 850 WA powered by twin Mercury Verado 300Hp outboards, this Capelli Tempest 850 WA has plenty of power for longer cruises and also the control for easy manoeuvring within the marina. She is capable of 50+ knots. Down below there is a small cabin with double bed, and a separate toilet compartment. There is a kitchen with hot plate (never used) and also a refrigerator. A great feature of this boat is that you can transport it throughout Europe without any special permits or equipment as it is designed to the maximum length allowed to be towed by a private individual.